Prototype: Historic double decker bus as was found in the Berlin area for example. 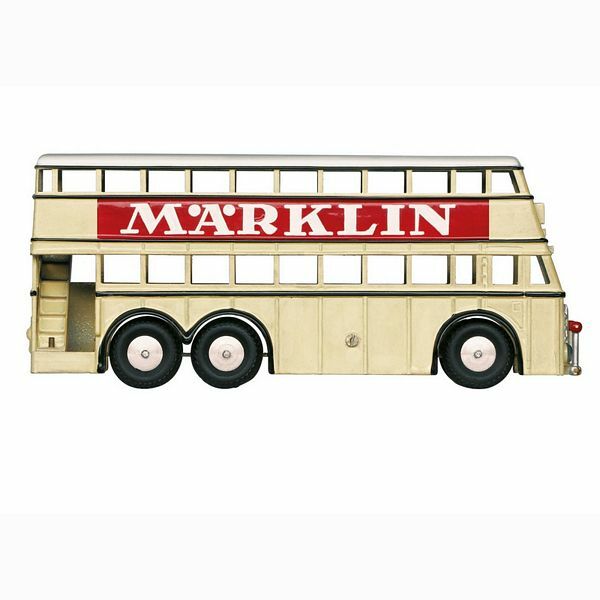 Model: This is the realization of an historic bus that has been in the Märklin archive for about 80 years but that until now had never been produced by Märklin. The model follows the historic sample exactly. The bus body is constructed of die-cast metal, the floor of stamped sheet steel. The bus has turned metal wheels with rubber tires and it can be rolled. The radiator grill, headlights, taillights, and other details are set off in different colors. The bus has an historic packaging design. Vehicle length 16.5 cm / 6-1/2". This historic bus is being produced in 2018 in a one-time series only for Insider members.